Disclaimer: In the interests of fairness, openness and objectivity the reviewer declares up front that he is a personal friend of the Author. Despite this I hope you find this a factual and objective review. The subject of armour deployment in Burma in WWII is like thes rest of that campaign – rarely ever discussed or covered. The 14 Army considered themselves the Forgotten Army and history seems to reinforced their belief. This, the latest title from The Factory Publishing, like the “The New Breed” is really the first serious title to address the employment of the British and Indian Armour in Burma from a modelelrs and vehicle enthusiasts perspective. I have always had a great interest in this theatre of operations and have read most of the available histories including the Indian and Pakistani titles available and I was impressed by the amount of information Dennis has unearthed which makes this a truly outstanding title. For those of you that are not familiar with the Factory Publishing titles this follows what I consider to be the best format for the modeller. It begins with a very detailed and well researched introduction closely followed by a description of the tanks employed, Specific modifications made to them which are well supported by detailed photos which will be a huge help to the modeller. Dennis follows this with a section on the Markings and colours used including Tac Signs, Formation Signs, AOS etc. 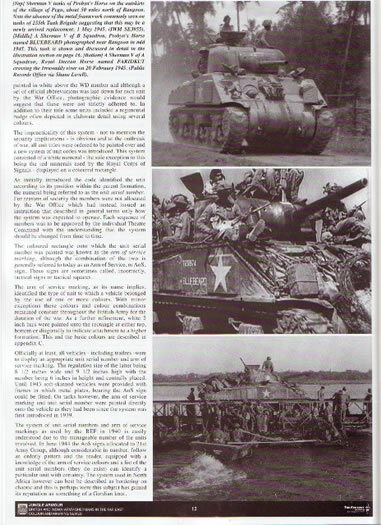 Following is an 8 page spread of superb colour plates covering the various Shermans employed including the rarely covered DD and the Sherman IIIs used in the Dutch East indies immediately Post War. Well researched histories of the Various Indian and British Regiments cover the next part of the book and then we get to the books Appendix which are a goldmine of information. 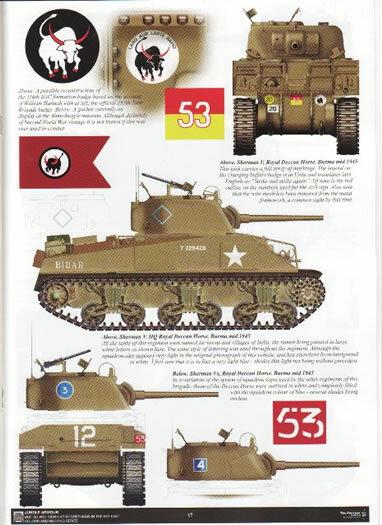 Sherman III DD WD Numbers with notes regarding other modifications these received such as the Brit All round vision Cupola. An excellent bibliography follows this, and I highly recommend all the titles covered. Dennis thoughtfully includes the Public Records office documents consulted for anyone wishing to do their own research. Finally printed on the back two pages (including the inside cover!) is a formation Diagram of an Indian Armd Regt 43-46 and a table of Sherman WD numbers allotted to SEAC 44-46. 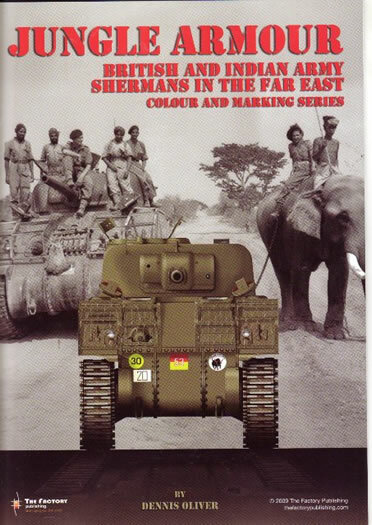 I cannot recommend this title enough and particularly to any modeller wishing to cover new ground with the New TASCA Mk V Sherman and the newish DML Orange series Sherman V. The photos are in the majority new and the whole package is there in one book from the history , the Vehicles and the detailed modifications to colour schemes, operational history and colour plates backed by fantastic clear photographs. If this is the new standard for the Factory Publishing then I believe they are on a winning formula which will appeal to Historians, Modellers and Vehicle/period enthusiasts alike. Quite simply this is one of the best titles of its genre I have yet seen, which I can assure the reader is quite a substantial amount of books which surround me as I write this.